This year I did something which I never did before. I dropped in on Thursday evening – and it was real fun. There was no pressure of showing the badge, no parking tags, no stress about reserving seats with shawls and jackets and no celebrities on stage to pay attention to. While the volunteers were busy setting up the idol and the kids busy rehearsing on the stage, I had a good time chatting with friends. 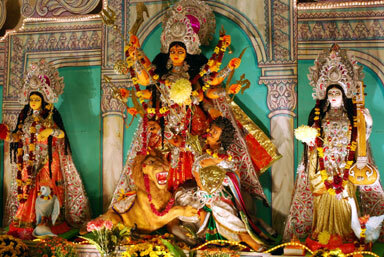 For once, after a long time, I had the pleasure of pure Pujo adda – completly unadultered fun. I think we should, at least informally, start the festivities from Thursday – just to prolong the enjoyment for few more hours. The formal festivities at the Kallol venue started on Friday afternoon. People started wheeling in their cars and under the strict vigilance of the security personnel who meticulously checked for parking tags and guided the cars to the parking lots. Inside, the doors were also well guarded with black uniformed and grim faced Caucasian security guards who were extremely mindful of their duties and didn’t allow a single fly without a plastic badge. On the makeshift stage, the idol of Goddess Durga and her family was well decorated and our revered priest Bhavani Mukhopadhyay was well into his three day long process of worshipping Maa Durga on our behalf. On Friday evening, the cultural events started after the community dinner that was served in tents outside the main building. 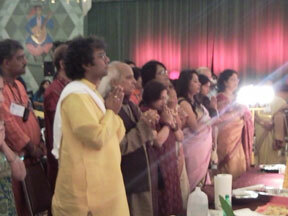 The highlight of that evening was the Hindustani vocal concert by Pandit Jasraj. Earlier that afternoon, Panditji and his students came in to join the Puja celebrations, offered Pushpanjali and Panditji even played the drums (Dhak). I guess the environment helped build up Panditji’s mood that evening and he gave a spectacular performance that lasted more than two hours. Panditji started with compositions in Raga Puria, followed by Bageshree, Adana, and concluded with a rendition in Bhairavi. All his compositions were in praise of the Goddess Shakti and the dexterity and fluidity of his renditions was something that can only be experienced. He was accompanied on the tabla by Pandit Samir Chatterjee and Aditya Narayan Banerjee and on the harmonium by his student Suman Ghosh who also provided vocal support. 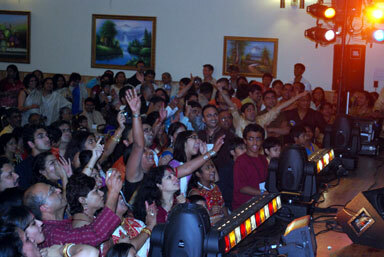 The other members on stage providing vocal support were his disciples, Tripti Mukherjee and Marina Alam Khan. Earlier that evening, the members of Kalamandir of New Jersey presented few dance numbers that were highly appreciated by the audience, especially the contemporary fusion presentations set to the music of Zakir Hussain and others. On Saturday evening, after a scrumptious dinner of spicy goat-meat and pulao, the audience settled in to their well preserved seats (with shawls, sweaters and jackets) for some scintillating performances which began with “Gupi Gayen Bagha Bayen” a musical play by the kids of Kallol directed by Aparajita Das. The play followed the well known story of Gupi and Bagha as told in the popular film by Satyajit Ray and also used music tracks from the same film. The kids (aged four to fourteen), in their colorful costumes and jazzy makeup, did an wonderful job in presenting the play despite few glitches in the audio system. Gupi, Bagha, Shundi and Halla Rajah, Montri-moshai, Jadukar Barfi, Senapati and others were excellent. For most of these kids, Bangla is something that they speak with some degree of difficulty. But for this play, they made a conscious effort to improve their Bengali diction and justify the message “Mora Bangla Desher theke elaam ….. Mora Sei Bhashatei kori gaan…”. And this is where this play succeeds. The next item was a dance recital by students of Mina Basu Nag that I missed, but have heard great praises about. Following this was the Kallol adults play “Ajo Kahini” (or the Goat Story). Since I was sort of involved with this production, I’ll refrain from commenting and wait for others to speak. However, from the audience reaction and the feedback I received later, it seems the play was well accepted – especially after the goat meat dinner. The last item that night was the “dhamaka” vocal presentation by Ujjaini Mukherjee – the SaReGaMaPa sensation. Although she was able to make many to dance to her tunes, I was a bit disappointed by her performance. First of all, singing to pre-recorded track music robs off the spontaneity that one expects in a live performance. Secondly, if her SaReGaMaPa judges were present, her scores would have been quite dismal to say the least. Sunday evening the stage lit up with fifty odd boys and girls of Kallol in a dance extravaganza titled “Ami Sei Meye”. The show, choreographed by Sunrita Mitra, traced the life of a girl from her childhood to womanhood through a series of contemporary songs and dance. 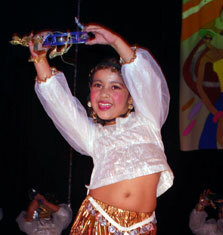 The kids were bubbling with energy as they romped through the stage in a riot of rhythm and color. The final program that evening was the vocal presentation by Debojit Dutta, another product of the SaRegamapa talent search contest. 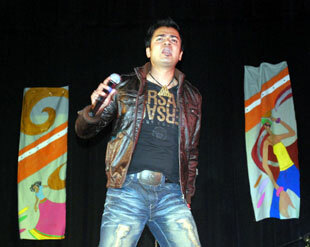 But Debojit was explosive on stage – he sang, he danced, he gyrated, he jumped into the audience – just like a rock star. Although he was also singing to pre-recorded tracks, but was helped on the keyboard with one of his musicians. His range of selections was also well appreciated by the audience who went berserk with the high octane music blared out by their favorite star. Debojit may not have pleased some of the seniors of Kallol, but he was surely a big hit with the younger crowd. Durga Puja, the greatest Bengali festival, comes and goes. But what remains is the happy memories of our children’s performances on stage, those heated discussions in the lobby, those laughs and jokes in the dinner lines, and some flashes of wonderful moments on stage by some of the legendary performers like Pandit Jasraj. Let’s not destroy this by over commercialization and making the festival a collage of marketing banners as is done in Kolkata these days. Let’s try to keep the Puja our own. The other day, one of the Kallol volunteers told me how one of the attendees complained to him saying that he didn’t like anything at this festival – the cultural programs, the food, the arrangements – nothing! I told him that this festival is not a Broadway show or a restaurant. If the person wants to have the best food, he should go to a restaurant. If he wants to see a professional show in a comfortable auditorium, he should opt for a Broadway show or a similar event. Having said that, I would say the Durga Puja festival is a great bargain with three meals and top level performers ( a Pandit Jasraj concert would cost a minimum of $40.00 in any city in this country) giving their best on stage. There is room for improvement, but instead of complaining we should come up with constructive suggestions and help the organizers. I would like to invite the readers to post their comments (click the comments link at the top of this post) and provide their feedback. This entry was posted in Arts-Culture, Generic and tagged adda, anandamandir, bangla, Bengali, blog, Business, car, community, concert, Cultural, culture, Dance, dinner, Events, expectation, festival, film, ghosh, goat, Harmonium, House, information, Kallol, listeners, Music, play, Puja, pujo, stage, ticket, vocal by sudipta. Bookmark the permalink. 2.GuDDu, aka, Sunanda Mitra – the new sensation in light designing … he single handedly changed the good-old flat light schemes to melodious and melancholy lights … thanks guDDu. I liked the “bhuter naach” lighting the best !! 3. First time I saw Puja Theater completes without any glitches !!! 4. Comeback of Dhriti Di after a period of pause … she was a surprise !! 5. NO ISSUES IN THE KHABAR PANDEL !! Well Said! From what I hear, pictures, and my experience on Friday night, Kallol Durga Puja was once again a fun experience. 1) There needs to be day tickets. As lots of discussion already yielded this conclusion, it is important to understand that there are 4 to 7 Pujas in the nearby vicinity during this time, and not everybody should have to pay for three days when they only want to come for one or two. 2) I can speak only for my mother’s dance school, Kalamandir, when I say that there are lots of people who aren’t necessarily part of the Kallol organization, but would like to appreciate puja for what it is – and their children’s dances that they work so hard for for months! There is a big difference between a community program and a school program – in a community, families should have to pay whatever the required payment is because they would attend that gathering anyway and it is a community program working with kids from all over Kallol map. But in a school program, it is the school director’s responsibility to take care of her students – performers who are not necessarily part of the same community but work their butts off to continue producing good shows in a community unlike their own. They should not have to pay a hefty $65 per person just to enter for one hour, especially when this is supposed to be a time for everyone. This is another reason why guest passes and/or daily tickets should be introduced. 3) We, as a community, need to revert back to the old system of volunteers. In this day and age, everyone depends on making things easier and quicker, so although there are still hard workers who work to make this Durga Puja happen every year, we have lost the meaning of having OURSELVES do everything. There used to be a new design and pandle for the idol every year. There used to be community kids who did the hall decorations. There used to be volunteers serving all the food and prasad. There used to be Kallol members checking for badges, cleaning the hall, keeping the hallways cleared. What happened to that? Instead of assuming that no one wants to do those little things anymore, why not look around and see all the people who do want to still do that (I can name 50 from the top of my head – including myself)? That was the essence of Kallol Puja – doing things ourselves so that it feels like it is OUR puja. There are other bones to pick, and it is obvious that I wasn’t completely satisfied with this year’s arrangements. But the only reason I am typing up so much stuff is because I actually care – this is the only link I have to a real puja here in this country. I will never be a full and complete Indian, because I grew up here and I have my life here. I can only do little (and very important) things to keep that link – learn Indian Classical dance, perform and spread the Indian culture, and attend my favorite puja of the year – Kallol Durga Puja. I think this year Kallol did a wonderful job during the Durga Puja. I would like personally congratulate the Executive Members who very efficiently conducted evrything thing in an extremely professional manner. Finally everything ran on time without any serious glitches. Thanks once again for giving us such enjoyment. This was my first Durga Puja in a few years and I must say I was very impressed with the results. It was also my daughter’s very first Durga Puja and she has a wonderful time, especially when she played with all the children there. Even my boyfirend enjoyed his first Durga Puja (he is from Delhi; loved all the cultural programmes. I have one photograph that looks like Durga Puja happening in Kolkata. Wow, this looks really nice. It’s amazing to see how Durga Puja is celebrated by NRI bongs. Really it did not look like it was in NJ. Where do you get the idol from? Is it taken all the way from India? The idol (made of fiber-glass) is brought all the way from Kolkata – and our priest chants the mantras in pure Sanskrit. Well run, great programs and good food. What else do you want. We had a great time. Well done kallol. My congratulations.